Food prices and political conflict have a long, intertwined history. Think of the French Revolution: the guillotines came out after wheat prices shot up 88 percent following two failed harvests. But food and conflict seems to have become a particularly hot issue in the last decade. Two events in particular sparked the renewed interest. The first was the food crisis in 2007–08, when the price of basic foods spiked, fuelling a new wave of large-scale land deals, or ‘land grabs’, as corporations, the financial sector and new state players sought to secure land (3). The second was the wave of revolutions that unfurled with the Arab Spring, along with food riots elsewhere in the world, both prompted by rising food prices (4). Scientific predictions of looming, devastating climate-change impacts that will compound these pressures have added to the fears that our food supply, and hence our very political systems, are more fragile than we think. The trouble, as this chapter explores and documents, is that the proposed cure for a food system viewed in this way can be worse than the disease. The narrative of food scarcity and impending conflict is gathering steam in policy circles, emphasizing a “need” to dramatically increase food supply by expanding the industrial model of agriculture. Stepping back, the conventional framework for explaining the relationship between hunger, land and climate change is anchored around a common, singular notion of “security”: that pursuing large-scale investments in land and agribusiness can lead to food security, and the best way to do this is to put in place governance instruments that would guarantee security to investors. The drive for this security—including secure profit streams capitalizing on volatile, high food prices and increased commodities demand—has led to land grabs and dispossession across wide swathes of the world, with disastrous implications for the security of human lives and dignity. Meanwhile, important questions are not being addressed: who will carry out this new production, who will consume it, and who will control the land and resources needed to do so? The call for food security, powered by the underlying myth of impending global food scarcity, plays a key role in justifying the contemporary cycle of land grabbing—and on the pretext of tackling climate change may even exacerbate it. The global phenomenon of land grabbing was initially reported with alarm by nongovernmental organizations (NGOs) and the media, but it is persistently being reframed as “land investment” by those seeking to profit from it. The case of climate-smart agriculture, for example, demonstrates this dark irony. Proposed climate-mitigation strategies in the arena of agriculture have themselves become key drivers in land grabbing. This has been the case with the promotion of agrofuels that received significant state subsidies and support worldwide and were painted as a solution to both the energy crisis and climate change. This trend must be understood in the context of the rise of what Saturnino Borras and colleagues call “flex crops and commodities”—one offshoot of the recent convergence of multiple crises (food, energy, climate and finance) (5). Flex crops and commodities have multiple uses (food, feed, fuel and industrial material) that can be easily and flexibly interchanged: soya (feed, food and biodiesel), sugarcane (food and ethanol), palm oil (food, biodiesel and commercial/industrial uses), corn (food, feed and ethanol) and now carbon sequestration. It has resolved one difficult challenge in agriculture, that of fluctuating prices: diversified product portfolios avoid devastating price shocks, meaning more security to capital investments. The fact that key crops and commodities can ‘flex’ undermines the argument that the main motive behind agricultural land expansion is specifically food security while exposing the main motivation, which is to secure profits. With the emergence of relevant markets (including financialised speculative ones) and the development and availability of technology (for example, flexible mills) that allows multiple and flexible uses of these crops, diversification of products has certainly been achieved, but only within a single crop sector. When sugarcane prices are high, sell sugarcane; when ethanol prices are high, sell ethanol. When the actual market for biodiesel is not there yet, sell palm oil for cooking oil, while waiting (or speculating) for a more lucrative biodiesel market to emerge. Yet, as we know now, rather than reducing use of fuel or avoiding deforestation and forest degradation in order to curb runaway GHG emissions, agrofuels ended up contributing GHG emissions, especially through massive forest clearing (6). Tree plantations are another sector where global land grabbing is implicated. It is in many ways a kind of “flex commodity”—these are trees and forests with multiple and flexible uses, the emergence of which is traceable to the same changes in the global political economy that ushered in the rise of flex crops. Tree plantations can be used for timber extraction for industrial purposes and for the growing paper and pulp industry (for example, for packaging), largely for export. But the same plantation can be anticipated for possible rise in wood chip-based energy complex, while at the same time it can be used to speculate on carbon-offset schemes such as REDD+. During the past decade, this sector has had a rising impact on land use (7). Widespread concern about the negative impacts on local communities has led many advocates of land investment, such as Hernando de Soto and the World Bank, to argue that Western-style property rights will shield poor people from land grabbing and by implication prevent abuses under the banner of “climate-smart agriculture.” This has led to the development of a number of codes and standards, notably the “principles of responsible agricultural investments” (RAI principles) put forward by the World Bank, and the Code of Conduct initially proposed by the International Food Policy Research Institute (IFPRI) (8). Yet efforts to codify Western-style property rights and make them more transparent have not turned the tide against land grabbing. Unfortunately, even “good transparent deals” can still end up involving grabbing, because what is being “grabbed” is not just the actual physical resource itself but, more profoundly, the political control over it: in other words, the very power to decide how it will be used and for what purposes—and not just now, but into the future, as well. Land grabbing does not always or automatically mean the expulsion of communities from their lands; it can also mean their incorporation—for good, or for ill, or both—into new economic arrangements through lease, labor and growing contracts. Justifying a deal with the argument that relevant authorities were “consulted” ignores the weak political position of poor people that enter into land-deal negotiations, as well as the dangers and insecurity created by the privatization and commoditization of land that can quickly lead to dispossession. The growing climate crisis is a warning that rather than deepening an unsustainable land, agriculture and food system, we need a radical transformation that returns power to farmers and communities and reintegrates ecology into the way we grow food. One term that encapsulates that vision for transformation is the call for “food sovereignty,” made originally by the international peasant movement La Via Campesina in the early 1990s. Food sovereignty is broadly defined as the right of peoples to produce, distribute and consume safe, healthy and culturally appropriate food in sustainable ways in and near their territory‑all issues ignored by the term “food security.” (9) Food sovereignty addresses the issue of “distancing” (producer-consumer, geographic distance, rural-urban) that is a hallmark of industrial agriculture and a major cause of greenhouse- gas emissions. The food sovereignty alternative emphasises “localisation” of the food systems, (although this concept is not without its own problems), essentially taking the control away from industrial corporations and putting it back in the hands of local communities. As agrarian scholars Saturnino Borras, Jennifer Franco and Sofia Monsalve have argued (10), food sovereignty needs to be accompanied by ‘land sovereignty’: supporting the demand for land by rural working peoples. The term connotes “belongingness”: the land belongs to the people who work it, care for it and live on it. Conversely, the people belong to a particular land as a people. Land sovereignty also reminds us that individual and collective plots of land are part of larger, socially constructed landscapes and waterscapes in which we must strive for a renewed relationship with land‑one that supports workers’ rights, bolsters and strengthens communities and engages consumers, all within ecological boundaries. Ultimately, the growing demand for sovereignty over our land and food is a resounding call to ditch security narratives that focus only on securing food supplies and not on securing dignified livelihoods and fighting hunger. This demand is only becoming more urgent as corporate actors propose false solutions in the face of growing climate-change-induced stress in our agricultural systems. 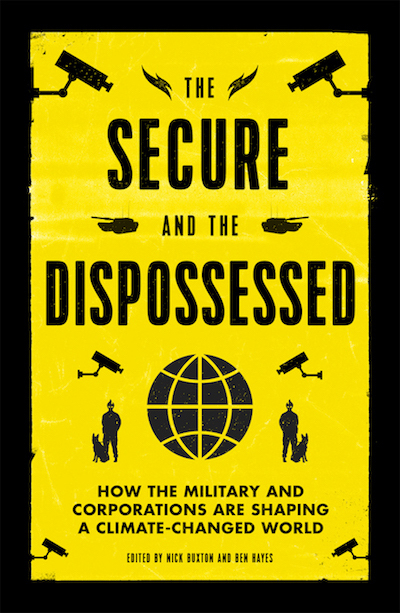 This essay was excerpted from The Secure and the Dispossessed: How the Military and Corporations are Shaping a Climate-Changed World edited by Nick Buxton and Ben Hayes, © Nick Buxton, Ben Hayes, 2015. First published by Pluto Press, London. www.plutobooks.com. Permission for future revisions or editions of this work must be sought separately. (1) Schiffman, R. (31 March 2014). Think the new climate report is scary? The food-pocalypse is already upon us. The Guardian. Retrieved from http://www.theguardian.com/ commentisfree/2014/mar/31/new-climate-report-food-prices-already-here. (2) Intergovernmental Panel on Climate Change (IPCC). (2014). Summary for policymakers (p. 18). In Climate Change 2014: Impacts, adaptation, and vulnerability. Working group contribution to the Fifth Assessment Report. Cambridge and New York: Cambridge University Press. (3) Holt-Giménez, E., Patel, R. and Shattuck, A. (2009). Food Rebellions! Crisis and the hunger for justice. Oakland: Food First Books; Bello, W. (2009). The Food Wars. London: Verso. (4) Mabey, N. et al. (2013). Underpinning the MENA Democratic Transition: Delivering climate, energy and resource security. London, Berlin, Brussels and Washington, DC: Third Generation Environmentalism Ltd. (E3G). (5) Borras Jr., S.M., Franco, J.C., Isakson, R., Levidow, L. and Vervest, P. (2014). Towards Understanding the Politics of Flex Crops and Commodities: Implications for research and policy advocacy. Think Piece Series of Flex Crops and Commodities. No. 1 Amsterdam: Transnational Institute (TNI). (6) Searchinger, T. (2008). Use of US croplands for biofuels increases greenhouse gases through emissions from land-use change. Science, 319 (5867), 1238–40. (7) Kroger, M. (2012). Global Tree Plantation Expansion: a review. ICAS Review Paper Series No.3. Amsterdam: Transnational Institute. (8) Borras Jr., S. and J. Franco. (2010). From threat to opportunity? Problems with the idea of a ‘code of conduct’ for land-grabbing. Yale Human Rights and Development Law Journal, 13, 507–23. (9) Martínez-Torres, M.E. and Rosset, P.M. (2010). La Vía Campesina: The birth and evolution of a transnational social movement. Journal of Peasant Studies, 37(1), 149–75. (10) Borras, S., Franco, J. and Monsalve, S. (2015). Land and food sovereignty, Third World Quarterly, 36(3). Zoe W. Brent is a researcher on agrarian justice issues and a fellow at Food First, Institute for Food & Development Policy in Oakland, California. This is an excerpt from Chapter 8 of The Secure and Dispossessed. Nick Buxton (co-editor) is a communications consultant, working on media, publications and online communications for the Transnational Institute (TNI). Annie Shattuck is a Fellow at Food First and co-author of Food Rebellions! Crisis and the Hunger for Justice (2010).